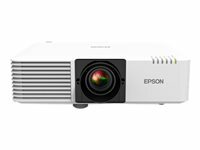 The compact, affordable PowerLite L500W laser projector delivers powerful performance for education and business applications. Get bright, vivid images with high color and white brightness. This robust projector also offers WXGA resolution for widescreen images. Featuring breakthrough laser technology, it delivers a long life laser light source. And, it offers virtually maintenance-free operation for the life of the optical engine. Plus, it features a large dynamic contrast ratio. It also features advanced installation features.